Annamalai, a short story written by R.K. Narayan, is an engaging pen picture of the narrator’s servant, gardener and companion of 15 years. The story begins with the arrival of a letter from Annamalai, who had supposedly left the job quite a few years back, and is now in dire need of money. As the narrator takes into account the meaning of the letter, he remembers his long association with this strange man, who had his own notions of evil luck and superstitions, was as ignorant of the names and varieties of plants as an illiterate is about writing, and yet was a proud gardener, taking pride in his well maintained garden. Narayan strategically makes fun of the ostentatious epistle, just received, which is supposedly written by an illiterate, rustic man, but bears the stamp of a school pedagogue, who always begins a letter in a highly affected manner, making a great pomp and show about the well being of the sender, and later shifts to mundane topics of money, health and family troubles. As the narrator broods over the letter, he remembers his old servant nostalgically, and recreates his persona for the benefit of the reader, beginning right from the old days when Annamalai came as a hired worker, and then decided to stay on as a gardener, a full time servant, a strange companion. He describes Annamalai as a whimsical person, whose past is in shambles, he is being fleeced by his own brother Ammavasai, and yet he thinks about settling the financial matters of his brother. He is too innocent to understand his brother’s dirty tricks, despite having a very favorable opinion of his own mental faculty. In short, Annamalai is a man of humble origin and modest intelligence, and he had garnered the narrator’s admiration by his unquestionable loyalty and devotion. The narrator had sneak peeks into Annamalai’s personal life through the letters he received from or sent to his brother and did not have a favorable opinion of his younger brother. And, once in a moment of weakness, loquacious mali told the narrator about a bond he had, signed by a tailor, which was to be renewed every year, and formed the prime motive of his going to village at regular intervals. On the last such visit, Annamalai never comes back and years later sends a letter asking for monetary help. But, the letter just received is as flashy as the epistles earlier received from Annamalai’s brother, and the narrator becomes perturbed as to whether he should really believe the sender, and send the amount required? Or, should he tear it off as a malicious attempt by Annamalai’s brother to usurp his rightful dues? As the narrator lingers on a bumpy ride in flashbacks, Narayan creates a wonderful story peppered with slight hints, curious remarks and hidden sarcasm. 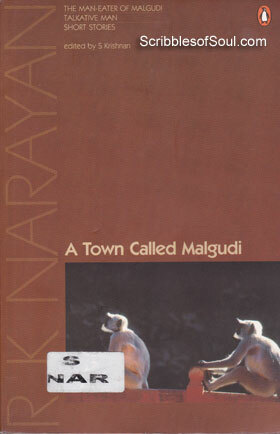 Annamalai is the longest story in the collection, A Town Called Malgudi and is quite experimental, as Narayan uses the flourishing epistle writing and makes fun of it at the same time. His puns are often based on Tamil words, which take on a different meaning, depending upon the tone and syllable stress by the speaker. The story is written in first person by the ghost narrator, the usual tactic employed by Narayan, except when he used TM in some of his works. And, as always the combination of first and third person makes sense, a typical Narayan style, employed with finesse in Guide. Annamalai comes across as an entertaining story, though there is hardly any central event or theme, yet Narayan has successfully painted the gardener in myriad hues, and presented him as an intriguing character. The story of a humble man, tackled with utmost sincerity, enamored me with its sarcastic tone and honest portrayal. Though, I would have preferred it to be slightly shorter and crisper. But, still, it is a good one to read.